﻿ Bip House, Krabi | FROM $13 - SAVE ON AGODA! "This is one of the best experience to have a very good and f..."
Have a question for Bip House? "Hi we stay at bip house for 4day start on 13-16may , we are so happy with the hotel and the service!" "Next time when gonto krabi definitely will stay here." "Nice location,friendly staff, big room with balcony." 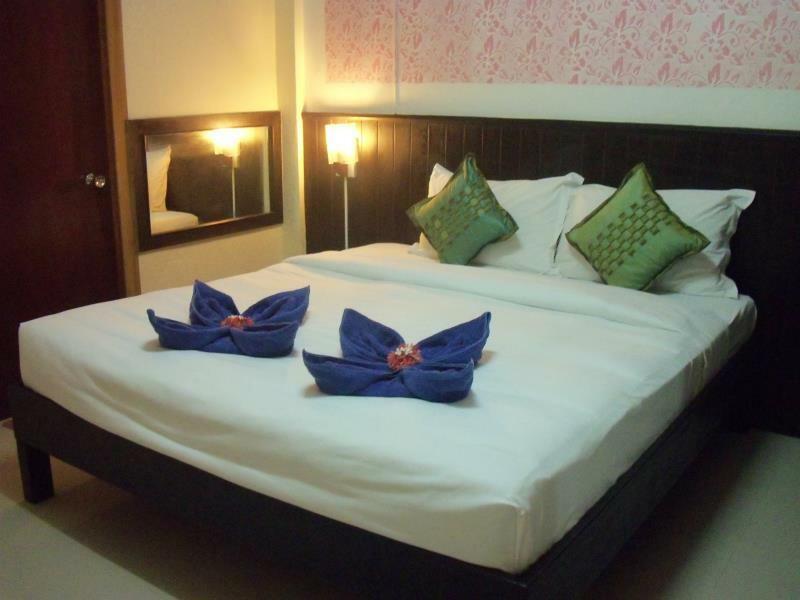 "Comfortable room with King size bed, cool air conditioning,..."
If what you're looking for is a conveniently located hotel in Krabi, look no further than Bip House. With its location just 17 km from the city center and 20 km from the airport, this 2-star hotel attracts numerous travelers each year. With its convenient location, the hotel offers easy access to the city's must-see destinations. The facilities and services provided by Bip House ensure a pleasant stay for guests. The hotel provides 24-hour room service, daily housekeeping, laundromat, free Wi-Fi in all rooms, postal service to ensure our guests the greatest comfort. 7 rooms spread over 2 floors provide a warm and pleasant home away from home. Modern comforts such as complimentary instant coffee, complimentary tea, mirror, towels, internet access – wireless (complimentary) can be found in selected rooms. The hotel's recreational facilities, which include snorkeling are designed for escape and relaxation. Discover an engaging blend of professional service and a wide array of features at Bip House. i love everything about bip house! the surrounding village, the safety, the owner of bip house hadee is very helpful! he also help (drop) us at krabi town whenever we want to visit there! next time sure we will come again and visit bip house! Really i don't know this hotel is very awesome... And i have to say that Bip Hotel is one of best hotel I've every stayed. The room prize is very cheap with Air Conditioner, TV, and Water Heater in the Bath Room. And the receptionist is Hadi, He always help me when i stayed. He drove me to Aonang beach. He is good man... And i recommend this hotel. Pleasure stay here. Will definitely stay here again once im in Krabi. Friendly staff and good service. The owner give me free cocount drink . The hotel itself in quiet area . 15mins walk to the beach. Nearby mosque and easy to get halal food. During morning in front of the hotel got a stall selling halal breakfast. This hotel is beyond my expectation because the decorations inside quite nice . Eventho this hotel got no windows but theres a balcony inside each room. Got fridge, hot shower, aircond, closet.The price so much affordable! Comfortable room with King size bed, cool air conditioning, mini bar fridge, LCD TV, Electric kettle, coffee/tea, bottled water, towels. However, only a small piece of soap provided. We brought our own body wash & shampoo. There is a cosy balcony with table & 2 chairs and it was always breezy as we had an end room upstairs. Room has a dressing table with stool & wardrobe closet. Mr Dee, the owner is very hardworking and kept the place very clean. If you need to refresh your room, or anything else, just ask him. He's friendly and obliging. Price is cheap for what you get and totally worth it. Local halal food right opposite or nearby. Family Mart 400m, main road (to Krabi town) with shops and 7-eleven, 600-700m, Nopporat Thara beach 1.4km, Aonang main beach area 1.7km, Wed night market & Aonang Muay Thai stadium 600-700m walking distance. Road in front of Bip house is busy. Best to hire a bike to get around. Will stay again if in Krabi. Mr.Dee was an excellent host and did go above and beyond to help out with everything. He even drives to the beach for free! Only downside with this place is that there is a heavy trafficing small road with no side walks. But other than that it was perfect. Good food nearby, 10min walk to nearest beach and night market. Very nice rooms. i don't really write down the review but i had to do this for this place. it is located in safe place. rooms are very clean and big. no insects at all! shower pressure was perfect. and air conditioner is working fine. the staff is extremely helpful which is the reason why i decided to write reviews. I've experienced 5 star services from him! i would definitely come back here again. can't thank you enough bip house! Our stay at Bip House was amazing and one of the best stays during our trip in Thailand. The manager is an absolute gentleman and went above and beyond to assist and help us get around during our stay. He even gave us a complimentary taxi ride after check out. The accommodation itself is spacious, clean and comfortable. I highly recommend Bip House during your stay in Aonang and I’m certain you won’t be disappointed. A five star review from me! Incredible value for money in the otherwise expensive Ao Nang. It's a short walk to the beach, which is the only flaw for this place which provides large air-conditioned bed rooms and excellent staff. I would stay again if visiting Ao Nang. Would definitely recommend this place. Host is very welcoming and kind. Room is spacious and very clean. Host let us rent a moped when we needed it and he even did our washing for us for a very reasonable price. Extremely hardworking, kind person & always ensure you will have a memorable & pleasant stay. Mr Dee willingly offer to send you around without any charge. The location is 10 minutes walk to Ao Nang beach area. Halal breakfast is right in front of the Guest House & mosque is around 8 minutes walk. Definitely will come back to his place. Super nice host. Clean. Green. Dee is the best.. Next time when gonto krabi definitely will stay here..
Lee's mom is very friendly and warm–hearted, and Lee's wife, too. When I came back from Pippi, Lee's mom send us two dishes of fried rice with egg and two bottles of water. They are the most delicious fried rice I have ever ate. It is very kind of Lee's mom. Lee's little daughter is lovely and beautiful. The room we lived for 3 days has a small yard which has sunshine and breeze and make us relaxed. The room is tidy and spacious with air condition and frig. It's not far from beach. Bip house 是不错的选择！如果再去一次甲米，我会带着礼物和你们相遇！Thank you, Biphouse.